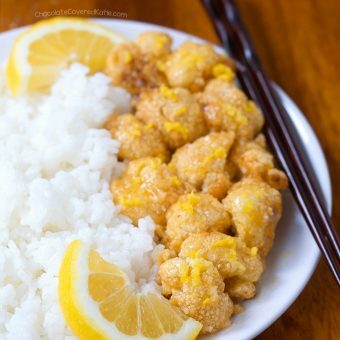 Sticky Sesame Cauliflower – the sweet, sticky, & addictively delicious dish that tastes like a better-for-you version of Panda Express! A few weeks ago, I got a text from a friend saying his sister was trying to add more vegan meals to her diet and asking if I had any good tips. The first advice I had was something I always recommend to anyone who wants to incorporate more plant-based meals into their diet, especially for non-vegans just trying to eat more meatless meals in general. My first recommendation is to NOT replace meat with vegan meat substitutes, which can just set you up for disappointment when you expect one thing and get another. Instead, think of it as an opportunity to explore new recipes and look at vegetables in a whole new light. So many people never venture further from preparing vegetables in a “mainstream” way—such as steamed or in a side salad—but when you start looking at vegetables as the main event, it opens up a brand new realm of possibilities. Try taking one of your favorite meat-based recipes and recreating it with your favorite vegetable instead. Think Kung Pao Eggplant, Mushroom Stroganoff, Sweet Potato Tacos, or Crispy Lemon Cauliflower. 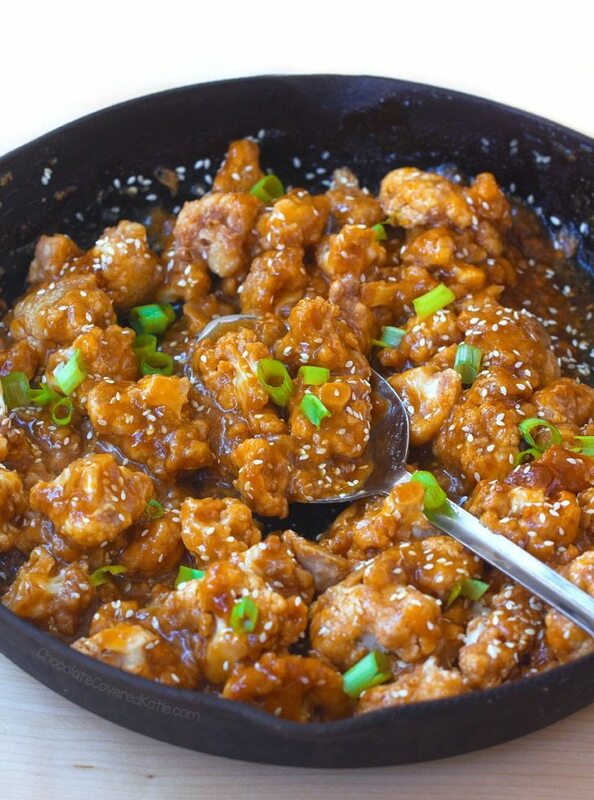 Or this sticky-sweet sesame cauliflower. 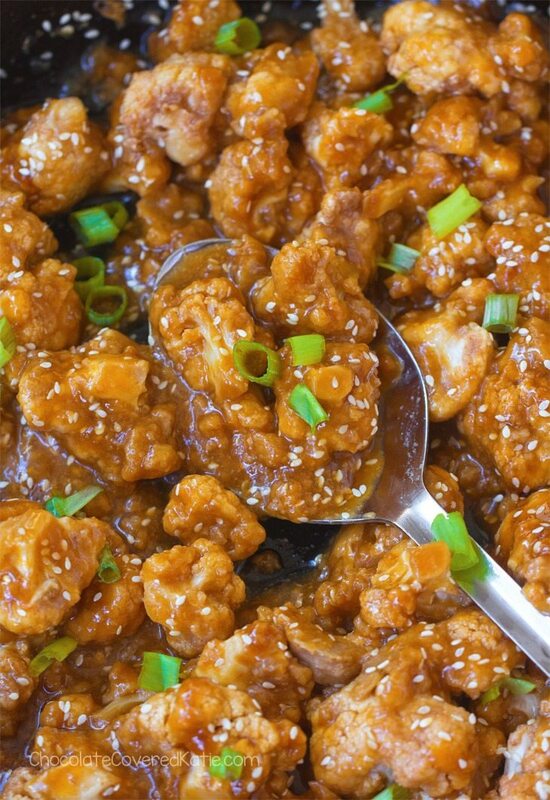 The best part of sesame chicken has always been the sauce… it’s the sauce, not the chicken, that makes you crave Panda Express every time you walk past the food court in the mall. 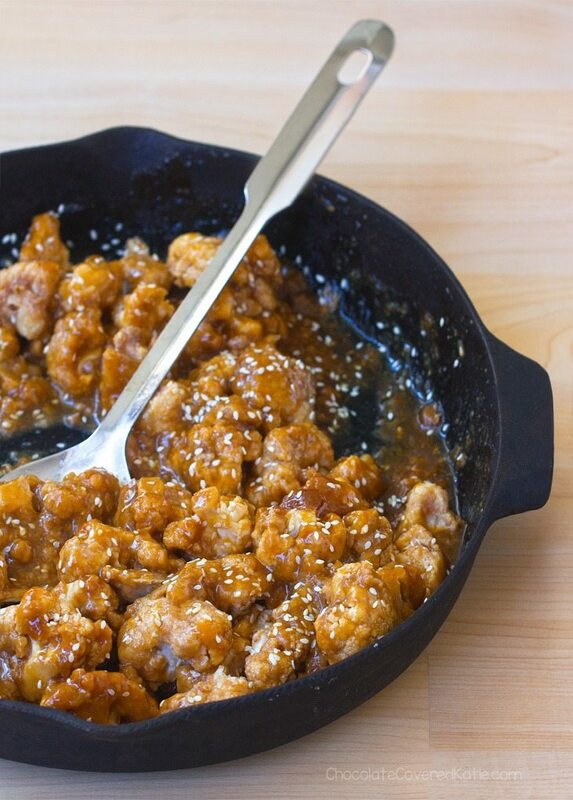 It’s the sauce, not the chicken, that makes sesame chicken so addictive. And this healthy meatless makeover of the classic recipe keeps all the goodness of that sticky-sweet sesame sauce intact. Plus, since you’re not using a fake meat substitute, there’s no expectation—subconscious or otherwise—that the dish will taste like chicken. Non-vegan dinner guests won’t be wary of trying a taste. Cauliflower—the darling vegetable of 2016—is definitely having a moment. 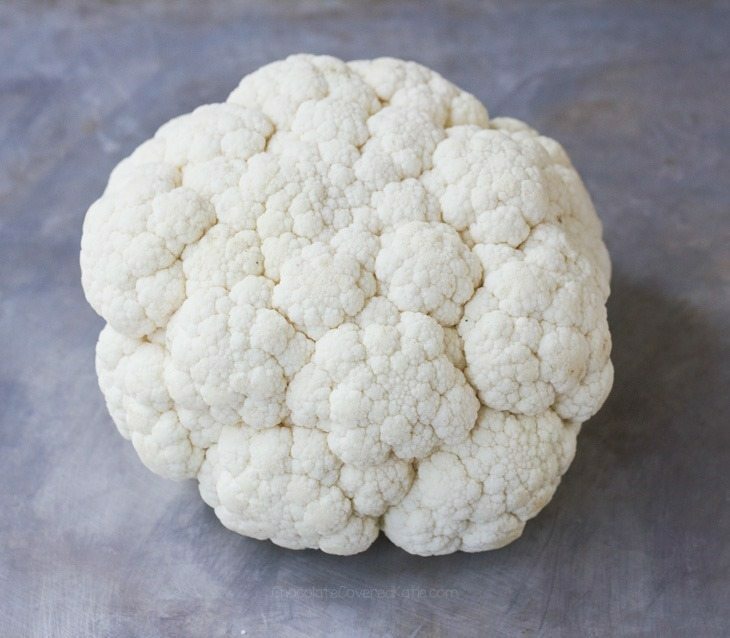 I’m predicting cauliflower is going to be the most popular vegetable of 2017 as well! Note: When I researched soy sauce alternatives online, I found a few comments who said you can combine 1/4 cup Worcestershire sauce with a tbsp or two of water to replace half cup of soy sauce. I haven’t tried it, but if anyone successfully tries this or another option, please feel free to report back for other readers. Also be sure to try this Cauliflower Mac And Cheese! Preheat your oven to 450 F. Grease a baking pan or line with parchment. Cut cauliflower into florets, then slice so one side of each floret is flat. Arrange in a single layer in the greased pan. Bake 10 minutes on the center rack. Meanwhile, whisk together the soy sauce, sweetener, vinegar, garlic, sesame oil, and ginger in a saucepan. Bring to a boil. While waiting, stir together the cornstarch and water until cornstarch dissolves fully, then slowly whisk this into the saucepan as soon as it boils. Turn heat to medium and cook 2 minutes, stirring more frequently once it returns to a boil. Cook until thick. You can also make the sauce ahead of time if desired, and it thickens more as it sits in the fridge. 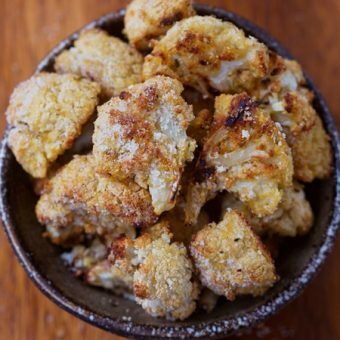 Flip cauliflower florets and bake 10 additional minutes. If desired, you can now move the pan to the top rack and broil 1-2 minutes. Pour sauce over florets. Sprinkle sesame seeds and optional scallions on top, and serve. *A few readers have commented to say this works in the instant pot, but I’ve not tried it. If you try, be sure to let me know how it goes! Previous Post: « NEW – A Month Of Healthy Meals! This looks awesome Katie. Reminds me a bit of Gobi Manchurian–though the cauliflower is deep fried in that–but wow it’s delicious!! I would not recommend using maple syrup though, I think it would alter the flavor. I know a lot of people hate faux meats, but they can be a good transition trick. I don’t use them much, but the one that is totally convincing is the beefy grounds. I’ve tried three different brands, and they are all great for stuff like tacos or lasagne. Though I still prefer just a good black bean taco or Daiya cheese lasagne! The sauce that makes this sticky looks just like what we’d use in chinese cuisine to make kung pao chicken! 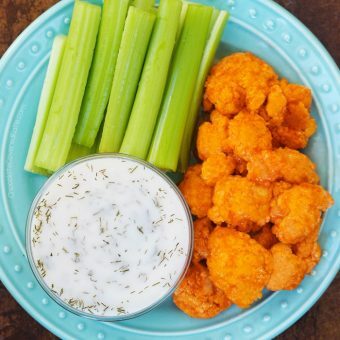 I eat keto, so I can’t use this recipe due to the cornstarch, though looking at it already wets my appetite! Have you tried using almond meal/flour instead of the cornstarch? If it still fits whatever macros you have to respect in order to remain keto? Having no starch at home but loooads of almond flour, I did this last time I tried a recipe fot a sticky sauce, and it worked wonders. I will probably make this recipe with this sauce as well. Only that for some reason my mouth is watering when I am thinking about making this sauce with pumpkin instead of cauliflower. Won’t be the same texture but might turn out to be delicious! I wouldn’t be concerned with such a small amount of cornstarch on keto. 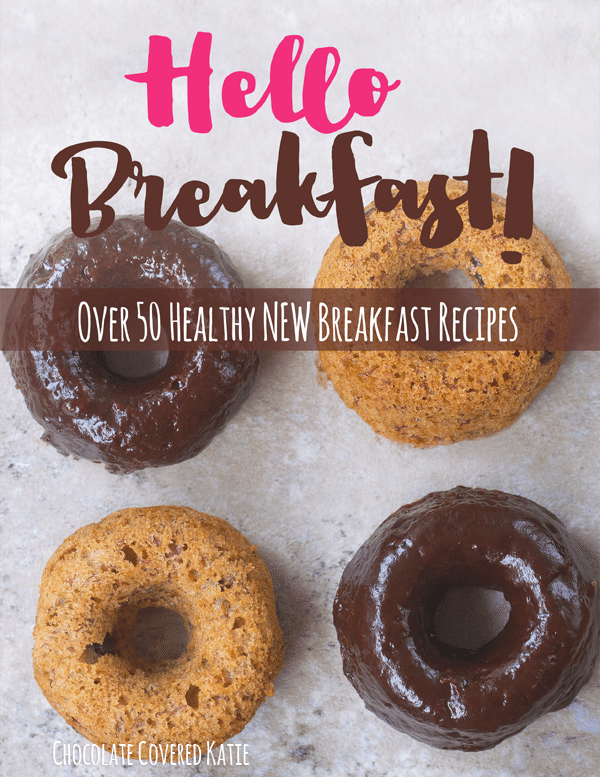 It’s all the sugar in this recipe that isn’t keto friendly. You can always use a little xanthan gum as a thickener but I’d forget about this recipe as a keto one. There are lots of “sweet n sour” keto recipes out there. I used arrowroot, and it works great. Can you use that? 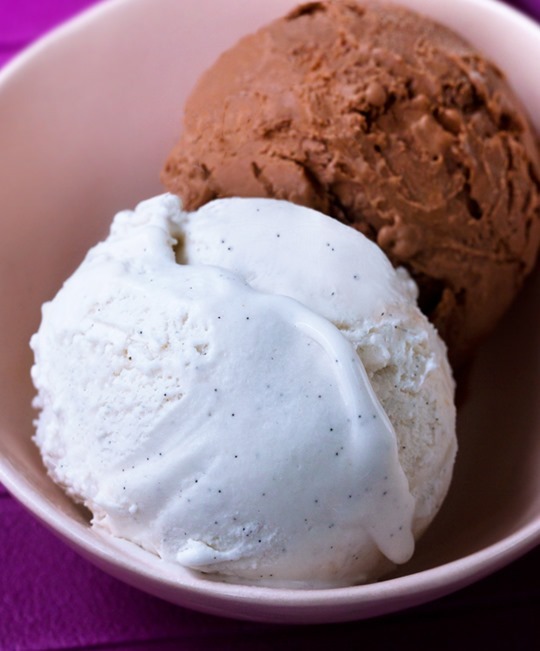 You can use arrowroot starch instead! You could use arrow root powder instead! This does really look delicious. I am just beginning to enjoy cauliflower. I am also on a Ketogenic Diet. What are your thoughts about using Sugar Free Maple Syrup, Sweetleaf Maple or Sukrin Gold instead of Honey, Maple Syrup or Agave? How about replacing the cornstarch or arrowroot with Xanthum Gum. Do you think it is doable?? Thanks so much! Yep another vote for keto here. Ever thought about it Katie ? Ketokatie.com sounds good hay ! A good substitute for soy sauce is coconut aminos. The brand I have in my fridge is “Coconut Secrets.” I got it at the whole foods store. This is what I use as well! YES!! What a great idea! I do love my plant meats, but I’m also a big fan of subbing cauliflower. I think this looks just amazing, and I cannot WAIT to try it. Thanks Katie!! Just to remind those trying to eat vegan, Worcestershire sauce is a no-go. It contains anchovies. Yes, you are right – it is all about the sauce!! Can’t wait to try this! Thanks Katie! Helene, I found a vegan/GF Worcestershire sauce at Whole Foods. I’m GF, so I’m going to use tamari in place of the soy sauce. Edward and Sons or Annies are two of the vegan brands out there. A lot of them no longer contain anchovies – just check out the ingredients before you purchase. The one I get is vegan friendly. I found a vegan worcestorshire on Amazon! There are a number of vegan brands actually. Look for Amy’s. I bought vegan worcestershire at Sprouts Farmers Market. Probably available at Whole Foods, too. I too use coconut aminos instead of soy sauce. Lots of flavor and a lot less sodium. This sounds so good. 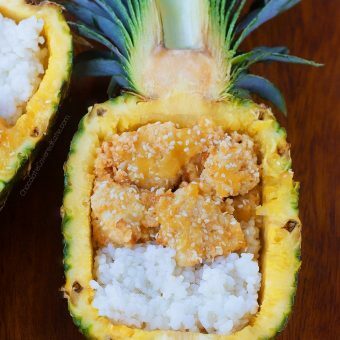 Its funny i actually never liked cauliflower until i tried it in rice form this past year. I am sure this sauce would make me eat it too. She has so many amazing recipes. 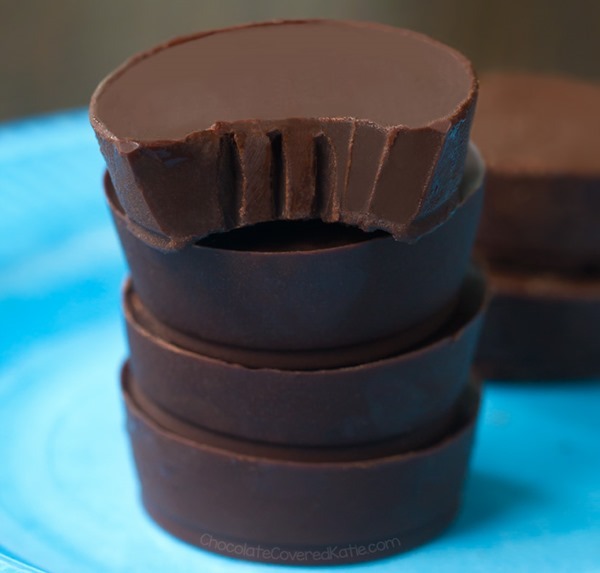 Katie, as much as I love your chocolate recipes, I am most excited when I see a new savory recipe. This looks delicious and I can’t wait to try it. Your Coconut Curry recipe is still our family number one favorite and ‘go to’. 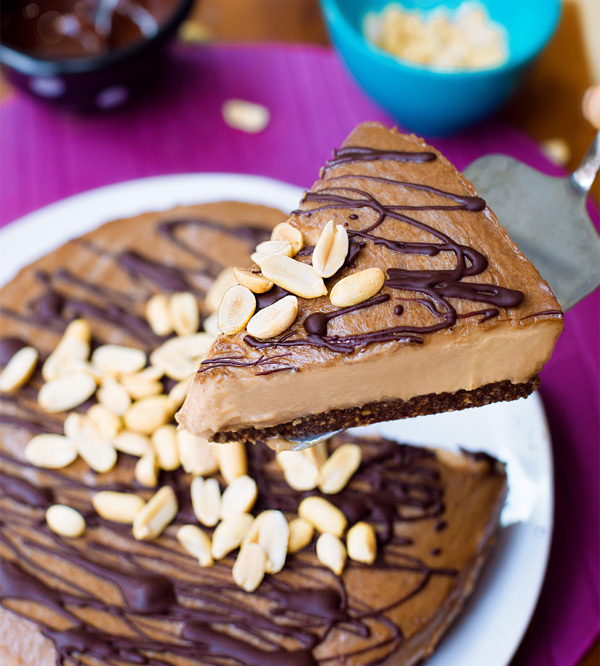 I have made something similar to this, and it does not disappoint! Sesame cauliflower will be on the menu soon. I agree about not just switching to meat substitutes, although it depends on the person. For some people, switching to vegetarian/vegan is a rough ride, and meat analogues can make it easier. However, they are expensive and generally high in sodium, so it’s best not to depend too heavily on them. 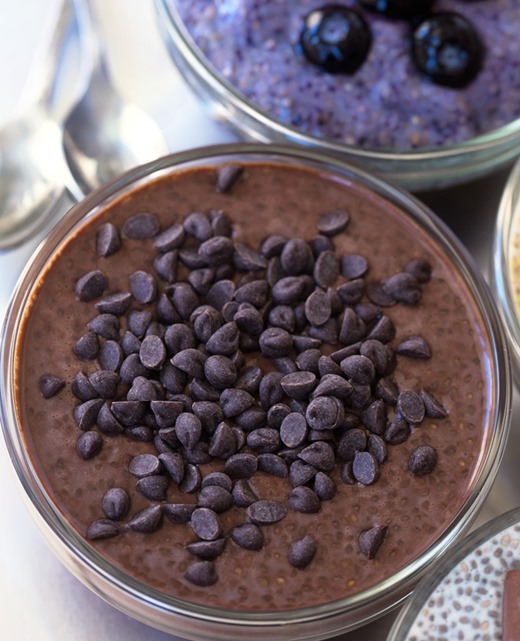 I love that you offer so many recipes that don’t include meat substitutes! This was excellent! And so easy! The kids loved it too. Had this for dinner tonight and thoroughly enjoyed it. Thanks for the great idea. A great soy sauce substitute can be made from a product called Gravy Master combined with water, rice wine vinegar, sesame oil, ginger powder, and garlic powder. There is no real recipe; just water and gravy master about 1/2 and 1/2, then add the other ingredients to personal taste, and more water to suit your purpose. I’ve added dark agave and oj concentrate, plus a bit of agar to make glazes for meats and vegetables from this combo. I use this because it’s low sodium, and hypertension runs in my family. Gravy Master–and a similar product called Kitchen Boquet–is a vegetable broth flavor enhancer that has been cooked down to a thick syrup. It’s used in soups and gravies. I do not know if it is gluten free…. Can the oven step be omitted? I prefer to limit cooking vegetables, being as close to raw as I can when I can. The taste will of course be different, but the sauce is fine by itself so if you like the taste of raw cauliflower (I don’t), then why not? HI, I am on an elimination diet and can’t do rice vinegar. Anything I could substitute for this?? You never know if something will work unless you try, but feel free to experiment, and be sure to report back if you do! What about Apple cider vinegar? It has a different flavor, but it’s what I always use when a recipe calls for rice wine vinegar. Or Balsamic vinegar might work here, too. I know both of those are Whole30 approved, so I’m assuming they’re approved on your diet. I used apple cider vinegar instead of rice vinegar and it came out delicious!